I grew up on a small dairy farm in New York State that milked Holsteins (those are the black and white Chick-fil-A cows) and a few Brown Swiss. I loved working with cows and showing cows at the fair with family and friends, so agriculture was a natural career path for a farm boy like me. 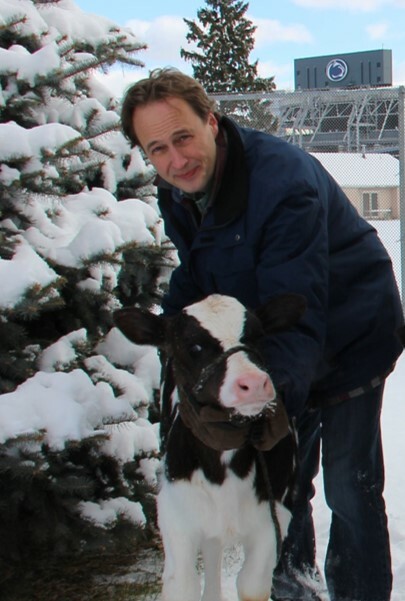 Eventually I became a dairy cattle geneticist. My family went to church, but faith was not really an important part of my life growing up. I made a lot of mistakes during my college years and was frankly embarrassed about the type of person I was becoming. That caused a lot of personal reflection, and I eventually turned my life over to Jesus and was baptized in my mid-20s. Soon after, I was married and my wife Elizabeth and I now have four boys and one girl. The intersection of the science and the bible has always been a fascination for me. With every new breakthrough in genetics and genomics, my faith is strengthened as the hand of the Creator and Designer becomes easier to recognize! be a bankrupt dairy farmer. I'll take green pastures and a blue sky over any city skyline! Genetic selection and crossbreeding strategies to improve cow health and fitness; genetic diversity in cattle; telomere length in cattle.